I’ve been noticing that a lot of my clients don’t like tomatoes! And I mean all food containing tomatoes whether it was raw, cooked or even tomato paste. I tried as much as I can to explain to them all the benefits of this important food item. Surely it would be advisable to know more about its nutritious properties! To start with, let’s clarify this point: Are Tomatoes fruits or vegetables??? The answer to the question is that a tomato is technically the fruit of the tomato plant, but it’s used as a vegetable in cooking. 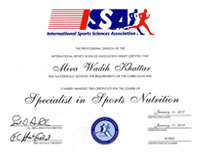 So unlike what people think, Tomatoes are considered and counted as vegetables, nutritional wise. There are many health benefits of eating tomatoes. They contain compounds that have been proven to prevent cancer, heart diseases, cataracts and many others! When it comes to healthy eating, there is a lot of reasons why tomatoes should top our shopping list! 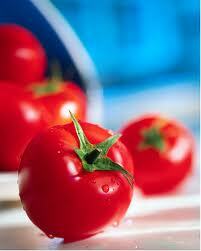 Tomatoes contain lycopene, the healthy antioxidant, which is increased by cooking unlike other nutrients. And research shows that lycopene is easier for the body to absorb if it has been heated. That means that tomato paste and tomato based soups are great ways to increase your licopene intake! 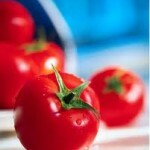 Lycopene, which is responsable of this bright red color, is also increased during the canning process of tomatoes. This antioxidant reduces the amount of DNA damage in our cells that usually happens with aging. Lycopene appears, according to lots of studies, to reduce the risk of developing diseases such as cardiovascular disease, cancer, diabetes, osteoporosis, and male infertility. Cooked tomatoes are the number one food that prevent prostate cancer!! One single tomato provides about 40% of daily vitamin C requirement which acts against cancer-causing free radicals. It also contains abundant vitamin A and potassium, and thus plays a vital role in improving vision and reducing high blood pressure. Tomato intake also reduces the incidence of urinary tract infections as well as bladder cancer. Tomatoes should take a very important part of our diets. Consume it in different forms whether as ketchup, sauces, soups, juices or as raw! One large tomato contains only 33 calories!! And this is a healthy easy to make soup! Try it!